Fairphone is a social enterprise with the aim to develop a smartphone designed and produced with minimal harm to people and planet. Fairphone does not rely on external investors or venture capital to operate their business mo del. Instead, they sell their phones on a pre-order model, which ensures that they can cover their basic operating costs and invest in social impact projects as well as manufacture the Fairphone 2. They expect to receive orders for 15,000 units by the end of September 2015 before production starts, which will ensure their costs are covered for the first batch, and also ensure continuity of production for the next batches. If you place your order now, you can expect delivery of the brand new Fairphone 2 towards the end of the year when the first batch will become available. Both Debbie and I own first generation Fairphones, and we would like to share our thoughts about the Company and its product as users. To our complete delight, we discovered that Fairphone is available on a contract in the UK through a unique partnership with the Phone Coop, who are themselves an ethical and socially-conscious company putting people before profit. We are not interested in making huge profits for the benefit of a few shareholders. We are here to provide you with the best possible service and to ensure you can keep in touch with your family and friends. That’s why we offer honest and transparent prices, with no hidden charges, and try our best to keep things simple. That’s also why our UK-based customer service is actually full of real people instead of call options. We have two-year contracts at £22 per month each, which spared us from having to find the €325 to purchase each of our handsets outright. The reason we chose Fairphone is because over time we became aware that the minerals used in the manufacture of mobile phones come mostly from conflict zones, which means that the mines where the minerals were extracted are mined in conditions of armed conflict and human rights abuses – most notably in the eastern D.R. Congo. We have been making gradual changes in our purchasing and consuming habits focussing on products which are manufactured in an ethical way and which cause the minimum damage to our environment and which are produced by companies who treat their workers fairly. We have also made the conscious decision to move away from products and services which force us into a regime or a pattern of consumption designed primarily for the benefit of its creators, for example those products with planned obsolescence which have been deliberately built to last a limited amount of time to force us into having to replace them. The Fairphone philosophy comes very close to our values, and that is why we have chosen these mobile phones. Having used them for several months, we have found them as good, if not better, than their counterparts in terms of functionality and usability, for example making and receiving calls, sending texts, checking emails, updating our social media, taking pictures and sharing them. All these functions are performed just as efficiently and seamlessly as any other smartphone. Where Fairphone really comes into its own is with it’s ‘open-source’ mentality, which means you can replace the battery, it is very easy to open, it has dual-sim capability, and you get the sense that if anything should go wrong, it can easily be serviced or replaced without having to scrap it and replace it with a new unit! It is also refreshing to opt-out of the endless need to ‘upgrade’ to a new phone after 18, 12 or even 6 months! Having a Fairphone means we have a mobile phone unit which will stay with us for a few years and should it go wrong, we are reasonably confident that it can be repaired and we won’t have to replace it with a new model which we would have to learn how to use all over again! If this strikes a chord with you, Fairphone are about to launch the Fairphone 2, which offers even greater flexibility in terms of it’s modular design, where individual components can be replaced easily and quickly. We wanted to make it fast and easy for anyone to do basic maintenance on his or her phone, bringing it back to full functionality without professional support. The most commonly broken elements can be replaced by the owners themselves, without requiring any technical skills. The implications are not difficult to fathom, a mobile phone that lasts longer means less scrapped phones, less waste, less depletion of the Earth’s resources and less anxiety having to learn how to use a new phone every few months and hopefully a shift in how we consume these types of products. Fairphone are a perfect example of a technology and communications company at the cutting edge of science but led by a couple of fundamental principles at the heart of their business, which are environmental and social fairness. Here is a video of their last pop-up space at Kwamecorp HQ by London Bridge during London Design Festival 2013. 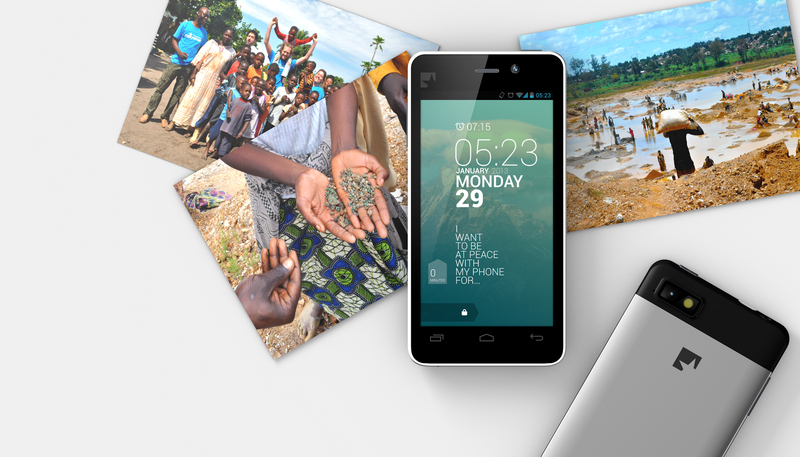 All photos used with kind permission from Fairphone under the Creative Commons Licence.